The name of Bakker, as an organ builder, is not one which is familiar to British organ grinders. In fact I am told that my Bakker organ is the first, or even the only one in the country, and so I thought I would tell you about it. The story begins in the summer of 1999, when Maggie and I went on a trip, organised by the MOOS, to Southern Germany. It was the occasion of the biennial Organ Festival in the town of Waldkirch, where many famous organs were built, and where there are still two (or possibly three) organ works still in existence.Waldkirch is in the district of Briesgau, or, (since "gau" means "district"), I suppose it is in the district of Bries. Why am I telling you this? Because it will explain something that may be worrying you as it worried me before I got to Waldkirch. When Waldkirch is described on the front of organs (for example Ruths) it is painted on the front as "WALDKIRCH i. B". Which I now know is short for "WALDKIRCH im BRIESGAU" = Waldkirch in the district of Bries. Anyway, be that as it may, Maggie and I really enjoyed our visit to the place, and we saw and heard lots of lovely organs from all over Europe. And I happened to see a couple playing a tiny little organ with a delightfully sweet tone, so I went over and had a word in my best German with the Zihlmanns, who were German-speaking Swiss nationals. "Can I have a go, please? ", I asked. This was easily done into German as "Kann Ich, bitte? accompanied by a circular movement of the right hand as if turning a handle. "Ja, natuerlich. ", I was told, ("Yes, sure"), and so I had a go. It was splendid! So easy to turn, and so small. I hefted it, and it was so light too! In fact it had a strap around it for playing while hanging round your neck. It took me but a moment to decide that this was the organ for me. As we all grow older and more decrepit, we will all need a smaller and lighter organ, and this one would suit me fine. The Zihlmanns told me that the organ was built in Switzerland by a firm called D and G Bakker, and they gave me the address. Later, back in England, I wrote to the firm, and eventually ordered an organ just like the one I had seen in Waldkirch. The Bakkers make several different products, but this one is called the "Bauch-Orgeli", which I think translates as "Belly-Organlet", or Belly-Organ for short. Eventually the organ was ready, and then there were two problems. How to pay for the organ, and how to take de1ivery of it? I was able with great reluctance, to sell my Trueman Busker organ to the Doe Family, where I know it has a good home. Well, that (almost) took care of the first problem. And then I found that I was due to be going on a trip to the Continent with the Musical Box Society of Great Britain. I asked the permission of that Society to allow me to take delivery of the organ while we were on the tour, and they kindly agreed. So I went on the trip, although unfortunately Maggie was ill and unable to come along. However the rest of the group made me very welcome and were very kind to me. During the trip, the Bakkers met me by prior arrangement and handed over the lovely little organ, and I was as delighted as I hoped I would be. This handover took place when we reached Liege in Belgium. 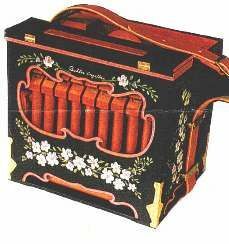 The Bakkers claim that their Belly-Organ is the smallest and lightest organ on the market that plays standard music. To give you an idea of how small and light the organ is, here are the approximate details. The organ weighs five kilos, which I think is about eleven pounds, and the dimensions are roughly 31 cm (12 inches) wide from side to side, and 25 cm (10 inches) deep from front to back, and 25 cm (10 inches) tall from top to bottom. To me the most amazing thing is that it does, in fact, play standard 20-note rolls, so I don't need to buy any fresh music. But whether it is indeed the smallest and lightest available, as the makers claim it to be, I do not know; perhaps somebody more knowledgeable than I, will be able to say? The organ was supplied to me unpainted (it was cheaper that way), and the first thing I had to do was to get it painted, or, (as I finally decided), stained rather than painted; and a mate of mine very kindly stained it a nice yellowish colour and then varnished it for me. Soon I hope to have some lettering and decoration added to it, so as to keep it in line with the yellow and green livery used by all my organs. (Yellow and green are the Brazilian national colours). The Bakkers are a husband-and-wife team. He (Jan) builds the organs, and she (Gretha) paints the organs, sews covers for them and punches the music. They are both Dutch by birth and training, but found that there were already too many organ builders in the Netherlands, and so they moved to Switzerland, although they also seem to have premises in France as well. I guess that the fact of their being Dutch and Dutch-trained, explains the lovely Dutch tone of the organ. I should like to add that I have no connection with the firm of J and G Bakker except as a (satisfied) customer. I am not their British agent or anything like that. In fact as Bakker organs seem to be unknown in this country, it would seem that they do not have a British agent. But I can provide their address if anyone is interested. I hope to bring my Bakker to the B0GA. Annual Gathering in October, so that you can all see and hear it.